For a cozy hideout that's a big step up from the standard blanket fort, craft an indoor-outdoor teepee inspired by one of these 5 imaginative designs. 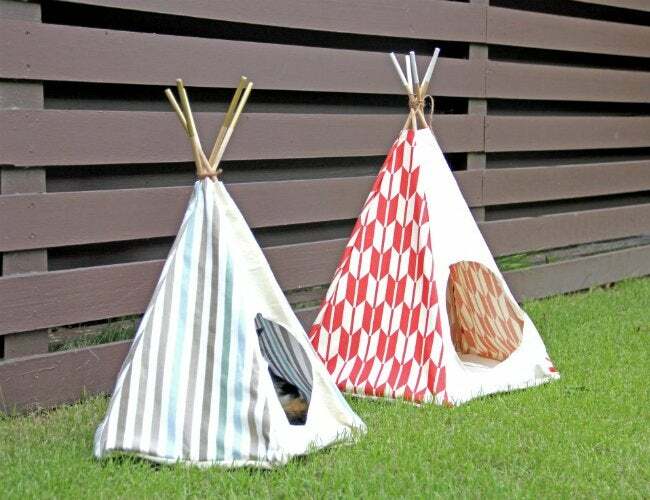 With a design that evokes images of dream catchers and fort-like fabric walls, teepees have grown to be a favorite hangout for kids, adults, and even pets! A wealth of options when it comes to construction—from simple no-sew tutorials to the more involved machine-required projects—make it easy for DIYers of any skill set to tackle this trendy hideaway in a weekend. Let these five crafty projects inspire you to build your own imaginative retreat. To skip sewing and ultimately shrink the total cost of this large DIY, the savvy blogger behind The Handmade Home raided her craft closet for a bundle of fabric scraps she had saved from previous projects. Each pattern was cut into strips of various sizes, wrapped around the DIY teepee’s six poles, and glued into place—no stitches required! At the top, string lights woven around the poles make this hangout a magical spot for playing, both day and night. 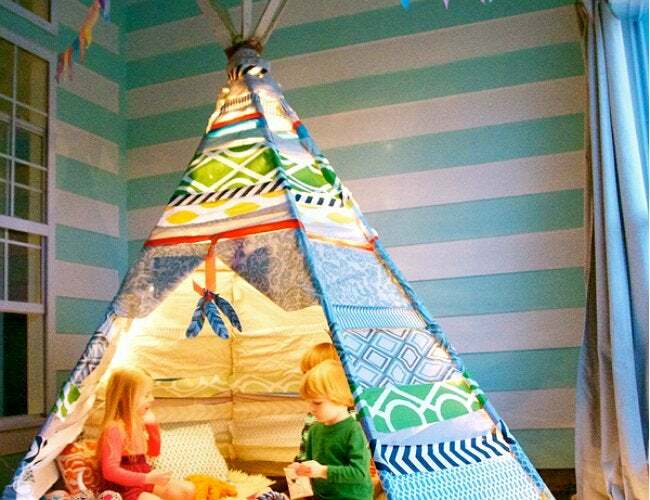 Mark your calendar for a slumber party under the stars when you craft a larger-than-life backyard teepee like this one from Boat People Boutique. 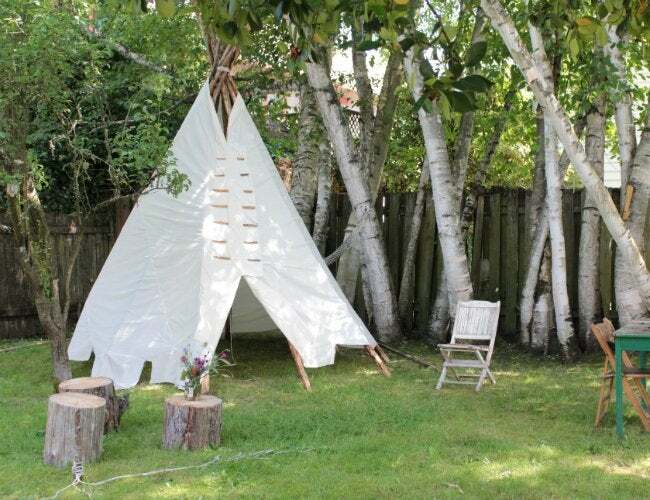 Thoughtful details including textured muslin fabric, 12-foot-long debarked branches for teepee poles, and scrap wood pins to hold the flaps shut will fuel your imagination, transporting you out of your own backyard and into the woodsy settings of your favorite childhood stories. Hello, living room hideaway! 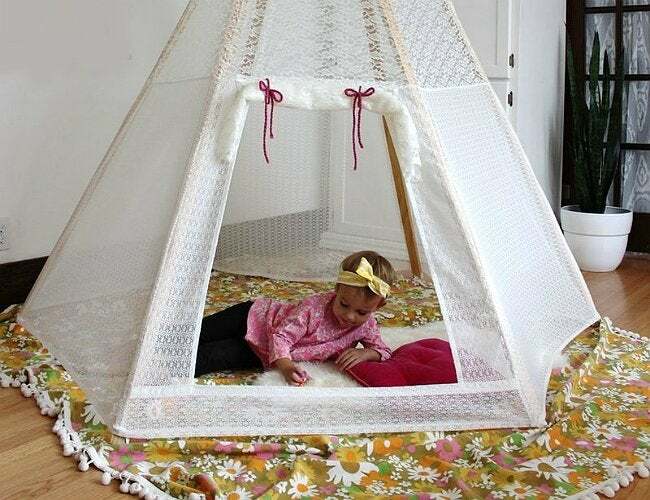 Even with the door rolled down, this lace-cloaked DIY teepee lets in lots of light so you can color, craft, read, or play in these cozy quarters. You may have to brush up on your sewing skills before you dive in, as you’ll need to measure and stitch together the paneled slipcover for your frame of 1×2 poles. Fortunately, the detailed instructions from A Beautiful Mess are there to guide you as you complete this pretty project. Why not let your furry friend in on the fun? These whimsical designs from FudgeJoy can be recalculated to fit a pet of nearly any size, whether it’s a cuddly cat or a petite guinea pig. Fluffy will certainly enjoy a new snug sleeping spot, complete with a cushy fabric floor—and you’ll love an amusing pet accessory that’s a far cry from a carpeted cat tree. For a lightweight and light-on-the-wallet option, follow the lead of the crafty mom at Strawberry Swing and Things who structured her children’s teepee using a large drop cloth and cut-to-size PVC pipes. After you’ve saved on the bulk of the project by relying on hardware store basics, dress up the front doors and tie-backs of the indoor shelter with your favorite patterned fabric. 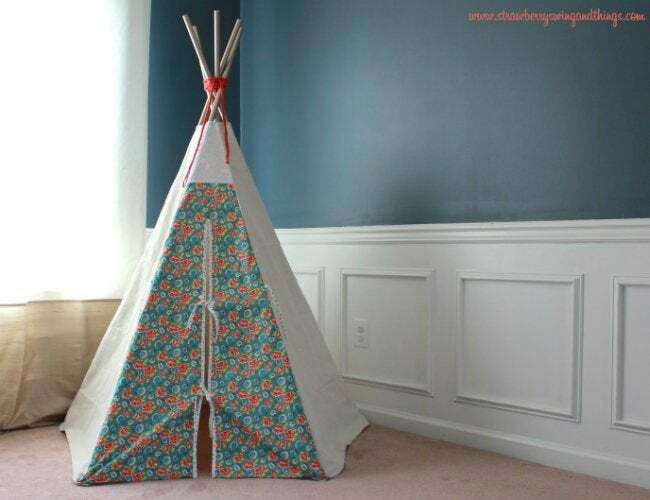 Depending on the print you choose, you can complete this DIY teepee for less than $50.